Bing and his friends love to play. 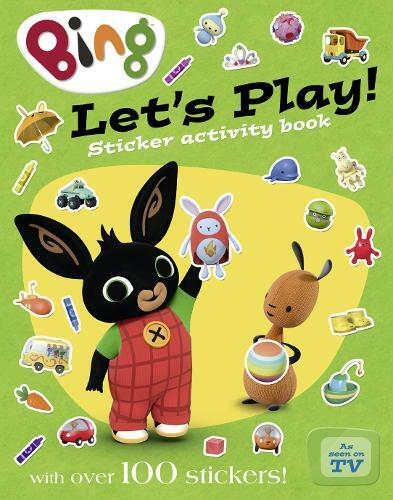 Join them in this sticker activity book, packed with games, activities and fun! Use your stickers to help Bing to play musical statues, finish his jigsaw, make eggy heads, build sandcastles and much more. Playing... it's a Bing thing! "Absolutely love this book! My son got this bought for him for his 2nd birthday because he loves Bing. This is the only book he's really enjoyed. He is always passing me it to read to him. We've read it that much he sometimes says some words before I say them! The big pictures and writing are really good for children. I will be buying the rest. Definitely recommend." "Lovely book. Bought for my 20-month-old. the book is really good quality and is lovely to sit down with. Keeps my toddler occupied." "Fab book. Bought this for our son's 2nd birthday and it was probably the best thing we bought! He absolutely loves it!" "Great book for a huge Bing fan! My daughter loves reading this." "Beautiful book with lovely bright pictures. My little boy will love this!" "Lovely book. Big hit with my son!" "Super book. Large writing and very colourful. Ideal for reading to child or being read by young child. Good quality too." "Round the corner not far away, my son loves us to read this every day." "Fab! Very popular with a Bing-mad toddler." "Great fun book for a young Bing Bunny fan; will keep little fingers and brains busy." "Our little boy absolutely loves Bing so this little book comes out every day!" "Perfect book for my 2 yr old toddler. Great for story time and building his word skills."